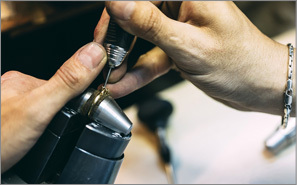 Using the latest techniques and latest laser technology, our experienced jeweler will give your jewelry and instant “make over” leaving them looking brand-new. At Crosby Jewelers we are 100% confident in our work that is why we encourage you to watch our master jeweler work his magic on your jewelry. That’s right, you can be part of the magic! ALL REPAIRS DONE WHILE YOU WAIT.